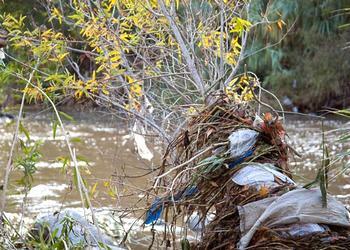 SACRAMENTO, California, August 28, 2014 (ENS) – The California State Assembly today voted 44-29 to phase out plastic shopping bags across the state. The legislation now advances to the State Senate where it is expected to come up for a vote before the legislature adjourns on August 31. The measure, SB 270, authored by Los Angeles Democrat Senator Alex Padilla, and two other Democrats, would prohibit grocery stores, drugstores, and convenience stores from distributing single-use plastic bags starting July 2015. Stores could sell paper, durable reusable bags, and compostable bags with a minimum charge of 10 cents each. The charge aims to encourage shoppers to bring their own reusable bags. “SB 270 strikes the right balance. It will protect the environment and it will protect California jobs as the state transitions to re-usable bags,” said Senator Padilla. The measure would provide up to $2 million in competitive loans to businesses transitioning to the manufacture of reusable bags. “Single-use plastic bags are not just a coastal issue. They are found in our mountains, our deserts, our rivers, streams and lakes. They are also in our parks and neighborhoods. It is a statewide problem that deserves a statewide solution,” Padilla said. Proponents say it would be better than the patchwork of bans that California now has. Currently, 123 cities and counties in the state have adopted a local bag ordinance, covering 35 percent of the population. Bans are in effect in California’s two largest cities – Los Angeles and San Francisco. But Assembly Republicans see it as an unnecessary tax. “It is a tax increase we impose to benefit local businesses,” said Assemblyman Don Wagner, an Irvine Republican. “It makes absolutely no sense as tax policy, it makes no sense as a jobs policy,” he told the “Fresno Bee” newspaper. A coalition of environmental, labor, business groups and local governments supports SB 270, including Californians Against Waste, Environment California, Heal the Bay, Clean Seas Coalition, California League of Conservation Voters, Coastkeepers, Surfrider, United Food and Commercial Workers Western States Council, the California Grocers Association, and the California Retailers Association. “In the end, it was the reports of overwhelming success of this policy at the local level that overcame the political attacks and misinformation from out-of-state plastic bag makers,” said Mark Murray, executive director of Californians Against Waste. Murray said the bill also seeks to protect and create green jobs by creating standards and incentives for plastic bag manufacturers to transition to making reusable bags. Last year a similar bill by Senator Padilla fell three votes short of the 21 votes needed for passage from the State Senate. At the time, Padilla pledged to redouble his efforts and seek passage of a single-use plastic bag ban this year. In January, at a press conference in Los Angeles, Senator Padilla, along with Senator Kevin De Leon of Los Angeles and Senator Ricardo Lara of Bell Gardens, announced the new bill, SB 270, which included language to address concerns over potential job losses at California plastic bag manufacturing facilities. Both De León and Lara voted against the 2013 version of this bill because they have plastic bag factories in their districts. They said last year that Padilla’s earlier bill would have hurt their working-class constituents. But environmentalists in their districts argued that there is too high a cost to marine life, birds and wildlife. 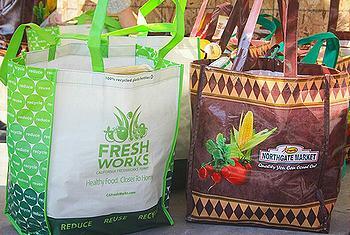 In California, only three percent of plastic shopping bags are recycled, according to CalRecycle. Single-use plastic bags increase costs to local governments for clean-up because so few of the bags are recycled. Padilla estimates that the combined cost of single-use plastic bags to California consumers and state and local government for use, clean-up and disposal is estimated to be in the tens of millions of dollars annually.